Your challenge is to modify the model by adding the production of copper nitrate. Review the chemical reaction being represented in the base model so far and what is missing. Aqueous silver nitrate added to solid copper will react to form solid silver and aqueous copper nitrate. Note that in our model we have breeds for AgNO3 , Cu, and Ag, but no Cu(NO3)2. We are missing one of the products! The concept of conservation of mass states that all mass must be accounted for. So for our model to be more accurate, we must account for all of the products. 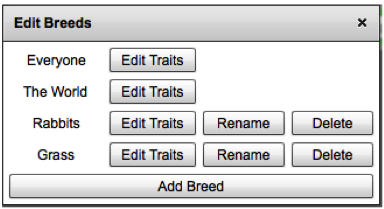 After adding your breed and creating it, test your setup. Did your Copper Nitrate agents appear? Are they the color, shape and size you wanted them to be? Test your agent's behaviors. Are they moving in solution as you expected? Upload a link to your model and a reflection on adding a new breed to your portfolio in the section "SL Nova Projects-Physical " under the heading "Adding Copper Nitrate".